Lipid Quantification Kit (unsaturated fatty acids) | Cell Biolabs, Inc. Traditional lipid quantitation methods require expensive HPLC or light scattering detection equipment. 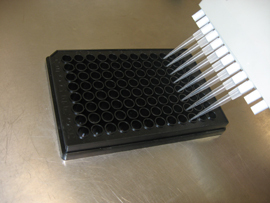 Our Lipid Quantitation Kit provides a simple method for quantitation of lipids in a standard 96-well microplate reader. The kit uses a sulfo-phospho-vanillin system in which samples are acidified and heated to solubilize and prime them for quantitation. In an acidic environment, vanillin reagent reacts with the lipids to form a colored product that is easily detected by the plate reader at 540 nm. Duteil, D. et al. (2016). Lsd1 ablation triggers metabolic reprogramming of brown adipose tissue. Cell Reports 17:1008-1021.